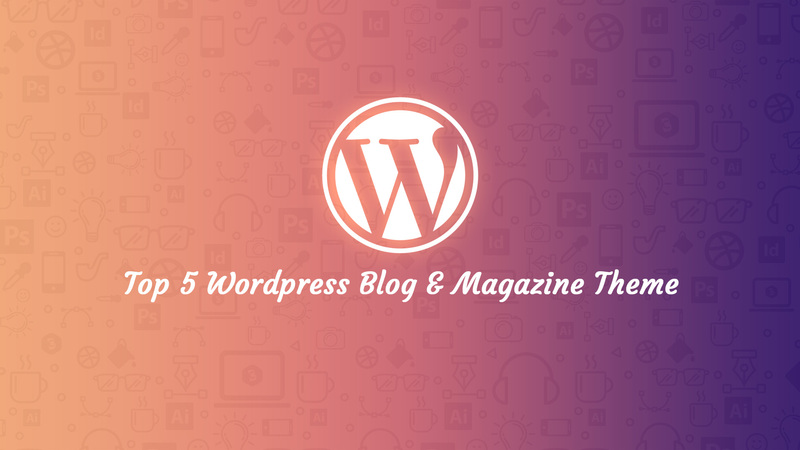 In this article, we will discuss top 5 WordPress blog magazine themes. WordPress is open source, powerful blogging and content management system (CMS). It’s having large developer community. Today, lots of individuals and organizations developing the themes and plugins for it. You can find open source themes and plugins on an official WordPress website. Some of the sites provide the paid themes which save our time. We can select as per our requirements such as blog, magazine, health, or etc. Newspaper theme is a WordPress theme that allows you write blog posts and articles with ease. It comes with enough components, great support, and assistance for a web magazine development. The Newspaper theme enables publish news, magazine, and newspaper apparently. Also, it allows videos from YouTube and allows a rating system for the more impressive purpose. Similarly, you can integrate this theme with bbPress Forum, BuddyPress, and WooCommerce, etc. It facilitates best ethical organic and PPC SEO practices and AdSense practices. Therefore, the developed websites will be money earning website forever. You will surely increase ROI with the increase of traffic of the website through SEO and PPC campaign. For this reason, your website will be much popular among the viewers and will earn regular traffic forever with valuable feedbacks. You can design newspaper sites, review sites and article sites obviously. Latest Newspaper version 8.7 is the best to design the new website. Likewise, other WordPress blog themes, this theme works well in the development of an effective blog. The latest Soledad Version 5.2 is well compatible with WordPress 4.0. Therefore, you will find many advanced features with Featured Slider Options and Topbar Options, etc in this version. You will definitely have the Real impressive gallery with various styles like Justified Gallery, Single Slider Gallery, masonry Gallery and Grid Gallery in different columns. Hence, your website looks great. The body styles of webpage vary with different styles like Full width, Boxed with any colors, Boxed with the background image, and a pattern image. Compatibility with BBPress & Buddy Press and category MegaMenu, etc. Video posts and image posts, Audio posts. 11 custom widgets like About me, List banner, Pinterest, Facebook, Instagram slider, Tweets slider and Recent posts, etc. Publisher theme is the useful and significant WordPress Newspaper, Blog and Magazine theme with excellent concentration. It also comes with incredible features, a spontaneous UI and everything else you wish to design outstanding websites. It does not matter if you wish to design news website, web magazine or personal blog or review website through Publisher theme. Publisher theme also offers countless customization options, look, and headers with a user-friendly Admin Panel. Hence, it helps in making beautiful and professional design with powerful features and a protected code base. Also, Publisher theme supports RTL style and languages absolutely. Hence, thousands of Hebrew, Arabic, and Persian sites include publisher theme in their news and magazine sites to publish web contents and yield money. It’s definitely better than all Newspaper and Magazine Themes on The Market. Also, these themes load much faster in mobiles like small phone iPhones, iPads, Android phones or Desktops. Hence, it helps design responsive websites to improve web magazine experience. HTML5 & Image ads and Google DFP Ads easily with several ad locations. Sahifa News Theme is an advanced, clean, user-friendly, faster-loading, editable, flexible, multi-functional and fully responsive WordPress News, Magazine, and blog Theme. It’s one of the most resourceful website themes in the world. Also, this offers many absurd features to improve your web page. Also, it manages to combine power and beauty, resulting in a high-class browsing experience for all online visitors. Fortunately, the Sahifa theme has solved all issues of resizing and compatibility. Also, customers who have tablets or smartphones can now visit your posts easily. Also, Sahifa can work with any operating system or browser. Clients are given complete freedom, and they can even turn off the responsive elements of their page. It comes with Fully Responsive and Retina Ready features. Also, it supports Mega menu, Dark Skin, RTL Support and Drag Drop Home Page designer with numerous Blocks Layouts. Google Web Fonts, and Mobile Friendly, etc. Likewise above themes, SmartMag is also a modern, responsive, clean, and retina-ready (HD) WordPress theme apt for magazines, blogs, online newspapers or review sites. It also supports front-end development up to great usability and provides user-friendly admin back-end. It’s drag & drop page builder tools help design unique and inspired homepages. Similarly, the SEO friendly websites will be easily developed using rich snippets and HTML5. Therefore, by SmartMag, design your content more interesting, attractive and usable. It also comes with Retina, RTL, responsive and other advanced features. All online visitors will reach your website easily as it is SEO-friendly and the respective website will yield the great range of traffic. Also, you will get all advanced facilities here with all kind of design tools and facilities to finish web design and development within the short period. Mobile menu options available for ease of mobile users. Hope, the above article must help those customers or developers to plan a right blog or magazine theme. You will have the best quality responsive news magazine site forever. Please feel free to add the comment if any query.